J & J Engineers - Manufacturer of hvls fans, eco jet mist fan & x hvls fan since 2016 in Ahmedabad, Gujarat. Volume to be ventilated 40,000 sq.ft. Maximum Effective Coverage 40,000 sq. 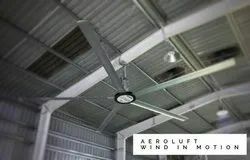 ft.
Envira North make HVLS fan is high volume low speed fan. The Indoor EcoJet Fans will supplement the cooling capacity of standard air conditioner, reducing electricity cost by unto 30%. 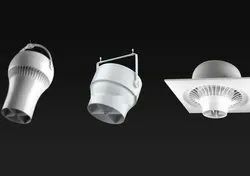 Outdoor Ecojet Fans will cool a hot day like spring rain but you will never get wet. No High pressure pumps or lines are required and no special electrical wiring is required. Unlike air conditioners that cool the room, fans cool people. 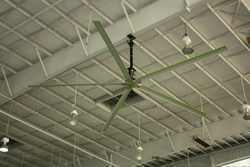 Our fans provide a constant even temperature from floor to the ceiling and wall to wall at a reduced operating cost. Installation of these fans minimises the need for expensive duct work in new constructions for both heating and air conditioning systems. The only Air turbine destratification fan featuring a Venturi nozzle design and patented stator system to ensure a laminar non-turbulent column of air is delivered from the ceiling to the floor below where we live and work. The combination of housing shape, patented stator, energy efficient motors, control selection and wide product range is what makes Airius the world leader in destratification technology. 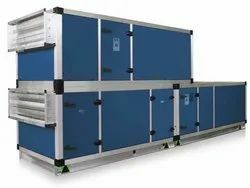 We have been Manufacturing Air Handling Units for almost 4 decades & have worked with most types of customer requirements. We have taken these experiences & mashed them up in to most commonly accepted specifications to finally create a limited ( but extensive ) list of product lines & air quantities. This also helps to shorten our delivery lead times to less than 15 days in most cases and times of the year.